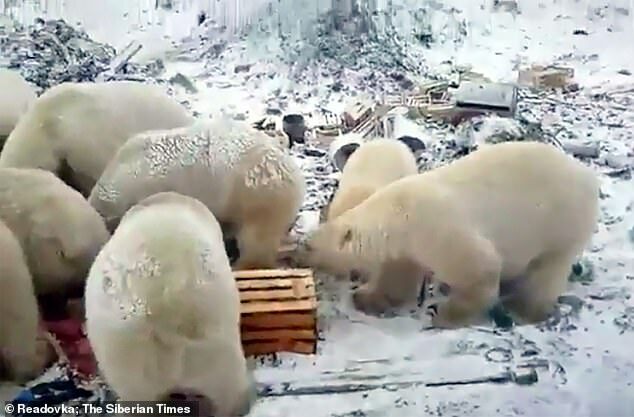 Polar bears have been filmed trying to break in to buildings and tearing through rubbish bags as they continue to terrorise a town in Russia. 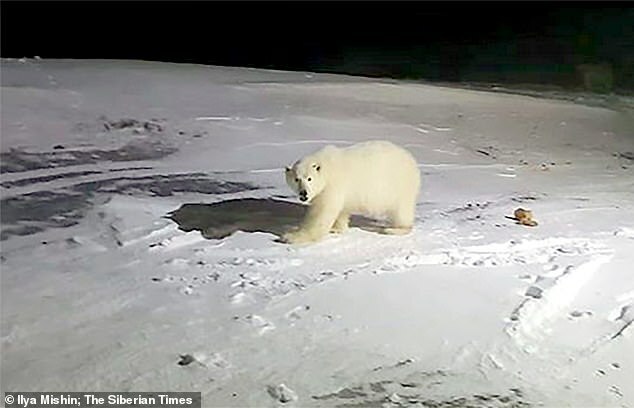 Officials are today starting an operation to sedate and remove dozens of the animals after they invaded Belushya Guba on Russia’s Novaya Zemlya archipelago. But residents remain so terrified that many are refusing to venture out of their homes for everyday tasks like taking the rubbish out. 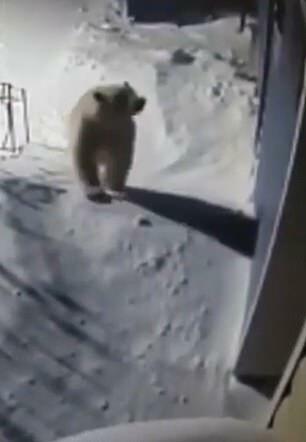 Video has emerged showing one bear up on its hind legs attempting to pound its way into a building. 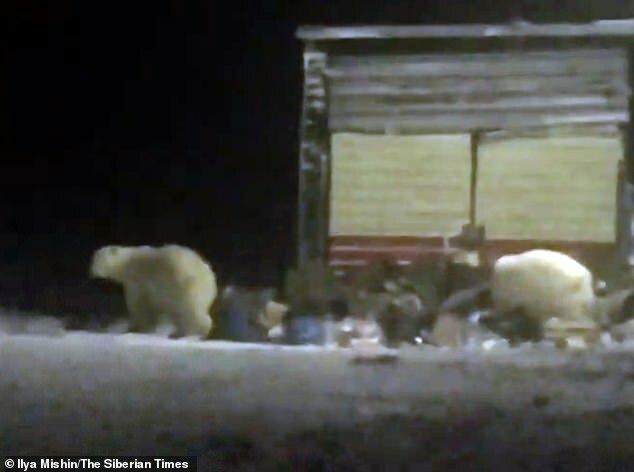 Local eye doctor Ilya Mishin also posted a night video of bears scavenging for throwaway food at a waste facility. 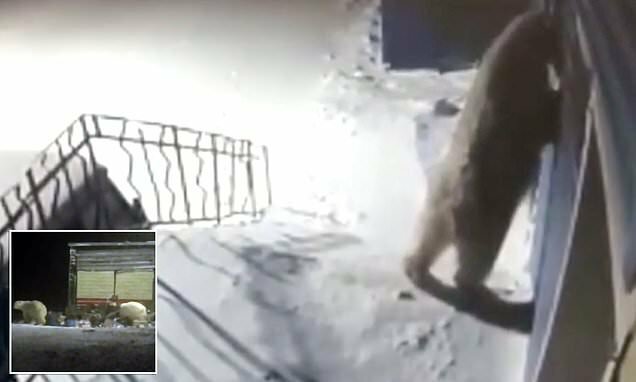 Another video posted by the Russian ophthalmologist shows a polar bear standing on two hind legs demanding entry to his eye clinic. ‘How often do you get door knocks like that?’ asked the medic. ‘He came for an eye check,’ commented his mother Natalia Mishina. A predator returns at night again seeking to get in through the door. ‘The bear is not allowed in – again,’ said Mishin, as reported by The Siberian Times. 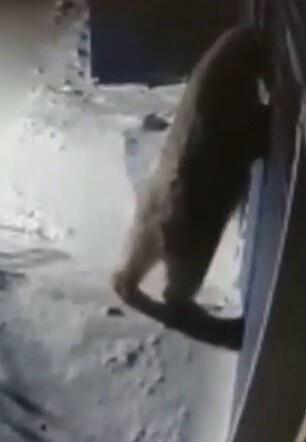 After failing to break open the door, the animal tries the window but without luck. More footage shows local stray dogs barking at bears which does nothing to deter them. 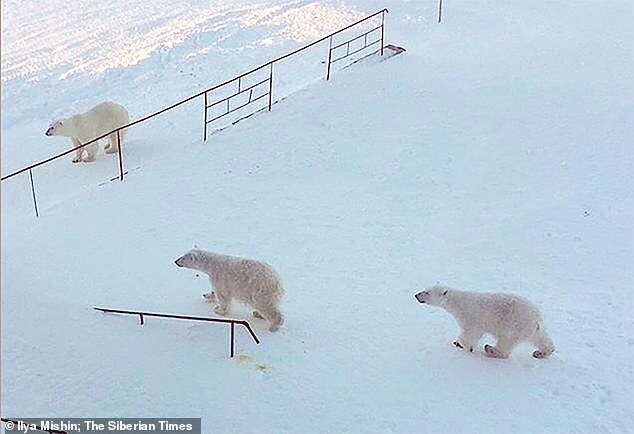 The reality of life in the town under siege from at least 52 polar bears was becoming clearer today as the Russian authorities flew in a team intending to sedate the predators and move them away from the stricken town. It is unclear how long the operation will take. As pictures from a previous operation show, this has been done before and involves airlifting the wild animals – but never on such a large scale. Novaya Zemlya was used for Soviet nuclear tests in the Cold War and is now the location of a Russian military base. Local woman Nadezhda Volf, 36, said the town of almost 2,000 residents was targeted by packs of polar bears from autumn. ‘The bears couldn’t make it to the shore on time to hunt so our dumps became the only option for them to eat,’ she said. ‘Before bears were not coming in groups and they were rare. From the beginning it was interesting to watch them, like in a zoo. ‘Once I was taking my child to kindergarten, and a family of bears was walking along the other side of the lake. 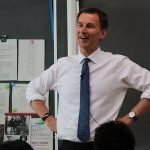 My five-year-old daughter was lost in admiration. ‘Another time, also on the way to kindergarten, our bear patrol was scaring away a cub – and he jumped out of a snowdrift in front of us suddenly. ‘I grabbed my daughter and started running, although I shouldn’t have run, thank God, the patrol was near. In one recent case she was confronted with seven polar bears in front of her. ‘They were in distance from us, but it still was scary because they can run really fast. ‘Adult bears were just walking, cubs were playing in snowdrifts and sliding on ice on their bellies. During a period of ‘polar darkness’ when there is no winter light the bears ‘started to blend together with the snow and terrify with their sudden appearance from around the corner or at the tip. She said that now a state of emergency has been declared in Belushya Guba ‘it is prohibited to walk alone’. Novaya Zemlya was the scene of the world’s largest ever nuclear explosion when the Soviet Union detonated the 50 megaton ‘tsar bomb’ at the height of the Cold War. This brave little wallaby got more than he bargained for!